Martin Maruskin blog (something about SAP): How to search for the data in PSA – choice 2. In my previous post I showed how to search for the date in PSA via standard transparent table in dictationary which underlay behind the PSA. There is another possibility more convenient in BW manner. The idea is to create DataSource of PSA and then check the data with standard BW tool: Extractor checker (TA RSA3). At first we create DataSource for particular node in PSA tree. 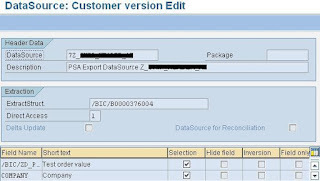 Navigate yourself in the PSA tree and choose item “Generate Export DataSource” from right click menu. 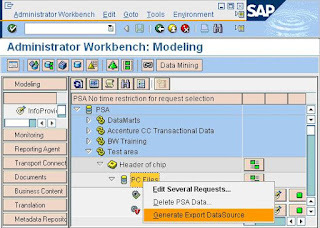 In this way SAP BW does generates a DataSource for your PSA object. On the next screen take a look on the name of your DataSource in field DataSource. 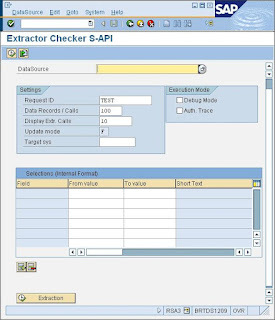 As a next step you can perform PSA searching in Extractor checker. Start up TA: RSA3 and choose your Datasource technical name form previous screen as a DataSource name. Now just run extraction. Please feel free to filter out entries based on Selection section of RSA3 selection screen. Hi, what is the difference between DataSource from 3.x and 7.0? TIA.